So, come support SLHS Chorus/PCA! Beloved Yoga and Rebecca Burgess are offering a special deal for 3 weeks in December for teens to practice yoga together. This class will be entirely an experiential practice – notebooks will not be needed. During the hour we will practice yogic mindfulness, postures, movement, breath work, and relaxation. Any and all teens and tweens are welcome, so invite your friends! In addition, all levels of experience and flexibility are welcome. The more the merrier! The special package price is 3 classes for $50 which can only be purchased at the studio (not on-line). Drop-in prices will be the regular kids rate of $18 per class. If you have any questions you can email Rebecca Burgess at rburg33@yahoo.com. Our Ensembles as well as student-directed A Cappella groups have been working hard in preparation for their next Concert! Each ensemble (students and their parents/guardians) is responsible for providing volunteers for at least one concert each year. And Seahawk Chorale has been designated to support this concert. Students will be expected to present a professional appearance for every performance. This is standard throughout FCPS Music Programs, as stated in the 2018-19 Course Syllabus. Therefore, please make sure your gown/tuxedo is READY for next week! Correct Concert Attire counts for part of your grade. 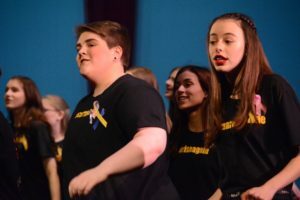 Congratulations to all the cast members and student leaders for being selected to perform in the Broadway Night (BWN) 2019 – Broadway Revival! And many thanks to those who made it to the Kickoff meeting last Thursday. If you were unable to attend, Mrs. Gigliotti will be posting the presentation. Please complete Registration AND Payment by 12/17! This year’s registration process is online. The process includes several components and only takes a few minutes to complete! To avoid the constant reminders and emails to complete registration, get it done as soon as possible. WIN Pride and Prize: Special treats await the first class to fully register by the deadline! All students must register online and accept the terms of the student/parent contract. When you first click the registration link, you will be taken to the student/parent contract. Please read through it carefully and select that you (Parent and Student) agree to the terms. Once you have agreed to the contract terms and click Submit, you will be taken to the payment form. Each student will be required to cover the “consumable” portion of the show’s expenses, that is, the expenses that directly go back to the student (i.e. T-shirt, Meals during tech week.) The fee this year will be $55.00. We encourage everyone to pay by credit card online. However, checks will also be accepted. On the payment form, select one of the three options for payment (credit card, check, financial assistance) and follow the instructions. You will have the opportunity to also purchase a DVD and additional t-shirts (the fee includes a t-shirt for the participant) as well as to donate to the program. If paying by check, please send it in to Mrs. Gigliotti in an envelope marked Broadway Night with the student’s name on the envelope. Please do not send in checks without completing the online registration! Remember: the registration deadline is MONDAY, 12/17/18 before the first rehearsal. We greatly appreciate everyone’s attention and timeliness! Coming Soon – Information regarding the rehearsal schedule, the parent volunteer survey and more! If you have any questions, please email: broadwaynight@southlakeschorus.org. That’s why we have been posting in the Notations every week and sending many emails out about missing forms. But it’s already December. So, please take this seriously if you have not turned in all forms to date. All forms are available at: Forms Page, and a link to each missing form is included in those emails. Additionally, we have made hard copy of the forms available in the Chorus office for those who cannot print at home.